Both the Grey Lady, the New York Times, and USA Today, have run stories (here and here) this week on the forthcoming exhibition of China’s famous Tarim Basin mummies and their gravegoods and possessions at the Bowers Museum in Santa Ana, California. The three mummies in the exhibit are European in appearance and date back as early as 4000 years, long before the opening of the Silk Road in the 2nd century B.C. I have a very short interview with Victor Mair, a Sinologist at the University of Pennsylvania and the leading expert on these mummies, coming out in Science magazine later today. In addition, I have penned a feature article for Archaeology on Victor Mair and the latest research in the Tarim Basin, which will hit newstands in June. But I will be attending the opening of the exhibition next weekend as a guest of honor, as the Bowers Museum has invited me to give a talk on mummies on Sunday, March 28th. So I will be posting here on my impressions on this major new exhibition. 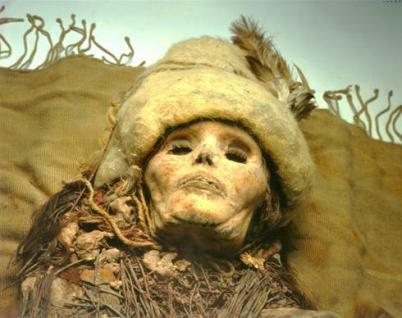 Chinese authorities have never before permitted any of the Tarim Basin mummies to travel outside Asia. I should mention, however, that I have seen some of these mummies before. A decade ago, I joined Victor Mair and a geneticist colleague in Shanghai while they were trying to obtain permission to sample some of the mummies for DNA testing. At that time, I was fortunate enough to be taken down into a basement room at Shanghai’s Museum of Natural History, where one of the Tarim Basin mummies lay in a glass case. Later, I wrote a chapter in my book, The Mummy Congress, on the finds from the Tarim Basin. These are extraordinary mummies. Their preservation is superb and they are daily revealing more about the lives of Bronze Age European migrants to Central Asia. I’ll have a lot more to say about this in a week’s time! We saw you and Victor Mair talk at the Bowers recently. Both talks were excellent and informative. Has anyone thought of bringing in a forensic pathologist to reconstruct the faces of some of the better-preserved mummies? Their usual task is to reconstruct a face from remains, to conduct a criminal investigation. Thanks for the feedback on the talk! I have not heard of any plans to bring in a forensic pathologist. There are just so many possibilities for research on these spectacular mummies — from analyses of dyes on their clothing to studies on the mummies’ hair to see what drugs they may have been consuming. As you’ll recall Victor Mair mentioned the ephedra–the plant source for ephedrine– found with the mummies. Did the mummies consume this plant? I think we will be learning a lot about these mummies in years to come. I agree that it would be very cool to see a reconstruction of the Beauty of Xiaohe!